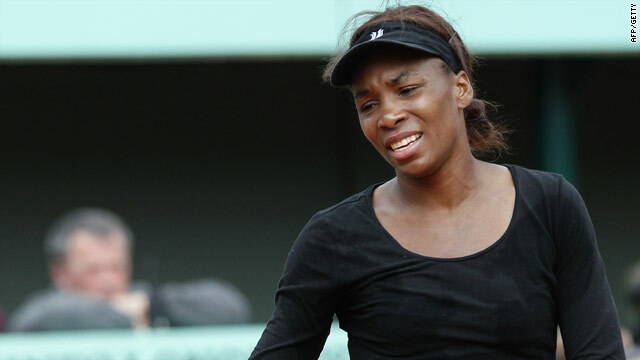 The pain of defeat shows as Venus Williams goes out to Nadia Petrova in Paris. (CNN) -- Second seed Venus Williams crashed out of the French Open with a straight sets defeat to Nadia Petrova of Russia in their fourth round clash in Paris on Sunday. Williams, a runner-up at Roland Garros in 2002 and hoping to meet her sister Serena in the final, was beaten 6-3 6-4 to Petrova, the 19th seed, on Court Philippe Chatrier. Petrova, who ended the hopes of home hope Aravane Rezai in the previous round, saved two break points at a crucial stage in the first set before converting the chance that came her way to take an early advantage. Williams broke early in the second set, but lost her own service twice to fall into deep trouble. The Russian was 5-3 and 30-0 up on Williams's serve when she made two unforced errors, but she converted her first match point with a fine forehand to progress to the quarterfinals. She will meet fifth seed Elena Dementieva, who breezed into the last eight with a 6-1 6-3 win over South African qualifier Chanelle Scheepers. Earlier, four-time champion Justine Henin fought off the brave challenge of former world number one Maria Sharapova to reach the last 16 of the French Open on Sunday. The pair had been locked at one set all overnight when failing light and drizzle brought their titanic encounter to a premature end. Sharapova carried on where she left off on Saturday evening as she broke to lead 2-0 in the deciding set but Henin kept her nerve to recover for a 6-3 3-6 6-3 victory. Henin, playing at her favorite grand slam venue of Roland Garros for the first time since 2007, will play Australian seventh seed Samantha Stosur for a place in the quarterfinals. The 27-year-old Belgian, who made a comeback to the circuit earlier this year after an 18-month layoff, was certainly extended by Sharapova, who is getting back to her best after a string of injury problems. The key to Henin's victory was the third game of the third set where she saved four break points to avoid going 3-0 down and broke back for 2-2 in the next game. Henin, the champion in Paris in 2003, 2005, 2006 and 2007, broke again in the sixth game only for the determined Russian to level again. But it was a brief respite as Sharapova lost her service again in the eighth game and Henin served out for victory, taking it on her second match point after two hours 10 minutes as her opponent hit a loose backhand. "Maria is a champion. You can't give her any opportunities. I am happy to get through," Henin, the 22nd seed, said after her seventh win in 10 meetings with Sharapova. "It was a real good test. The journey continues and I'm pleased to have a chance to win here at Roland Garros." Maria Kirilenko, the 30th seed who put out compatriot and defending champion Svetlana Kuznetsova in the third round, saw her challenge ended by Italian 17th seed Francesca Schiavone. She won 6-4 6-4 and will now take on Danish third seed Caroline Wozniacki, who beat Schiavone's fellow Italian and 14th seed Flavia Pennetta 7-6 6-7 6-2, for a place in the last four.